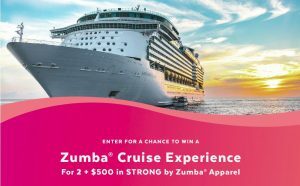 Enter for your chance to win a Zumba Cruise Experience for 2 and $500 in STRONG by zumba apparel! Prize(s): One (1) confirmed Grand Prize winner will receive: (a) one (1) gift code redeemable towards one (1) Zumba® Cruise Experience to take place during the period of March 24 to March 29, 2019 (code must be redeemed on or before March 19, 2019 at www.zumba-cruise.com) for the Grand Prize winner and one (1) guest, which includes one (1) balcony stateroom for two (2) people; and (b) one (1) five-hundred U.S. dollar ($500 USD) gift code to be applied toward STRONG By Zumba® apparel (redeemable on or before February 27, 2020 at www.strongbyzumba.com). In addition, each of ten (10) additional Runner-up winners will receive one (1) one-hundred U.S. dollar ($100 USD) gift code to be applied toward STRONG By Zumba® apparel (redeemable on or before February 27, 2020 at www.strongbyzumba.com). (Collectively, the “Prize”). Each prize code is limited to one (1) use for its total value at time of booking or purchase. Prizes delivered via post must be delivered to a valid U.S. address.